America’s transportation system is subpar because it offers little redundancy or choice to travelers. Delays, diversions and cancellations are becoming more common regardless of which travel mode one chooses. As populations grow in most of the country’s regions, highway traffic congestion is soaring, making travel times unpredictable. The same traffic impedes the intercity bus network, which has been cut to the bone. As airlines have consolidated into fewer hubs, minor problems that may initially delay one or a handful of flights (weather, mechanical, passenger-related, etc.) cascade into systemwide headaches as hub arrivals and departures are tightly scheduled. All the while, climate change is leading to more frequent and harsher storms, floods and fires that disrupt all modes of travel more often. A day in February 2010 when over 800 flights were canceled out of Atlanta. Photo by nesnet / Flickr.com. Too bad Americans don’t have a more robust passenger train system to fall back on and help keep people moving safely and reliably. 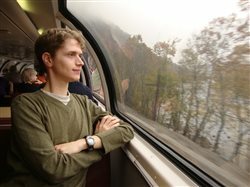 Sure, the train in many cases takes longer than flying, but when weather or other problems snarl air travel, many would rather be on their way on a train than wait it out at or near the airport. Yet incidents that disrupt rail traffic tend to have an outsized impact on Amtrak’s network given its skeletal nature of Amtrak’s network and the lack of more than one daily frequency on most of its route miles. Amtrak’s reticence to compel host railroads to allow alternate routings on normally freight-only trackage to bypass derailments, washouts, landslides, etc. —except in limited circumstances — means that trains are more likely to be canceled or, at best, replaced with much less pleasant motorcoach service. Two recent cases in point: Just last month, flooding and washouts caused a two-week-long suspension of the Cardinal between Washington, D.C. and Indianapolis. Somewhat miraculously, Wednesday’s CSX coal train derailment near Charleston, W.Va. only annulled one Cardinal trip in each direction — today’s eastbound made it through the area with only 40 minutes of delay. Secondly, instead of having the Coast Starlight use one of two alternate routes to bypass the recent two-month-long Union Pacific tunnel collapse in the central Cascades of Oregon (which was thankfully repaired much more quickly than expected), Amtrak was content to indefinitely suspend service between Sacramento and Eugene with no alternatives, despite having run a Eugene-Klamath Falls bus shuttle for a few weeks. A country where people cannot count on being able to get from where they are to where they need or want to be within a particular time frame is one that will struggle to compete with nations that have more robust transportation systems. Where more developed passenger rail networks exist, when an incident or weather disrupts one route, there are always alternate routes that may not be as fast as direct, but will get travelers to their destinations generally within a few hours of their original schedule. Traffic in Chicago in June 2013. Photo by Ken Lund / Flickr.com. This is the core reason why governments at all levels in the U.S. need to invest more in rail — for mobility resiliency. This isn’t something that’s just nice to have; it’s a must-have. Frequent, reliable train service provides all sorts of ancillary benefits — numerous studies indicate that every dollar put into trains returns more than five dollars to local economies — but the key thing it does is help unclog the nation’s arteries. Keeping people and commerce moving is key to what governments do to help their economies and people flourish. This point must not be lost when rail skeptics trot out all the usual tropes about wasteful subsidy and the minuscule percentage of the population that rides trains. Both of these facts are consequences of decades of public policy choices that, whether or not they were intended to, privilege highway and air travel over rail. They are not outcomes of the free market. We cannot expect commerce to keep flowing as freely as it does without some release valves. A more robust train system — one that offers multiple passenger train frequencies on a number of routes without impeding freight train service that meets shippers’ needs — would benefit all Americans, from our lungs to our pocketbooks, even those who don’t ride trains. It’s up to us to insist that our elected leaders put the policies in place to keep us moving sustainably in this resource-constrained, climate-altered century.